These soft Chocolate Almond Shortbread Cookies will not only melt in your mouth, but they will melt your heart! I adore shortbread — a buttery cookie that is oh so soft and delicate. And I especially love the simplicity of these plain, yet delicious cookies. However, in my attempt to make shortbread cookies, I was really craving something more. I wanted to add some type of chocolate and maybe a bit of a crunch to contrast the softness of the cookie. So, when wandering the candy aisle of my favorite grocery store, my eyes fixated on the beautiful bright blue wrapper of a Ghirardelli Sea Salt & Almonds Milk Chocolate Bar. Right then and there I knew that this what I was going to use and my Chocolate Almond Shortbread Cookies were born! 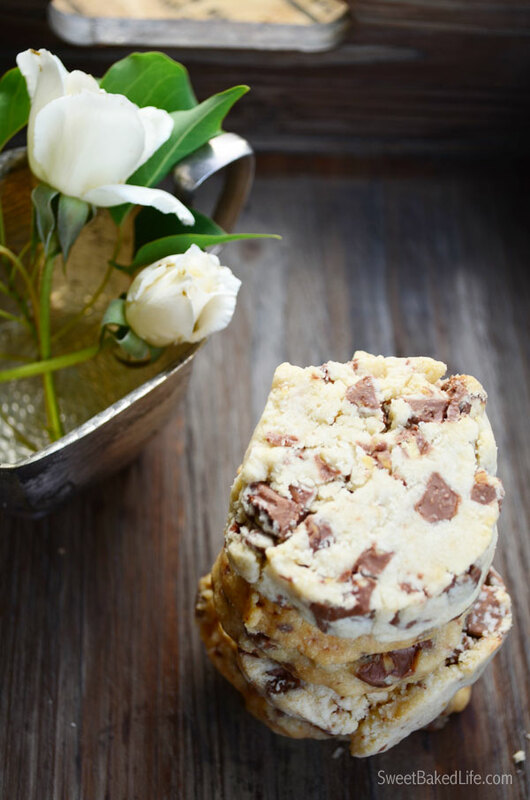 You start with a basic shortbread cookie recipe, then you add the chopped candy bar. Roll them into a log shape, pop it into the fridge for a bit. Then you slice them and bake them until they are lightly golden. The outcome is a soft buttery cookie with creamy milk chocolate, crunchy almonds and a hint of sea salt. With every bite you will want more! Now this is a cookie worth sharing as a holiday gift, cookie exchange, or just for consuming them all to yourself! And so easy to make! But since it is the season for giving, I would suggest you share these scrumptious morsels with those you love! In a large bowl of an electric stand mixer with the paddle attachment, cream the butter and sugar together until light and fluffy, about 2 minutes. Then mix in the vanilla until combined. In a separate bowl, whisk together the flour and salt. With your mixer on low-speed, add the four mixture to the butter mixture blend until it comes together to form a dough. Remove the bowl and add the chopped candy bar and mix with a spoon until incorporated. Dump the dough onto a large piece of wax paper, and shape the dough into a log – about 2 inches in diameter towards the bottom of one of the long side of the wax paper. The roll up the dough using the wax paper and put into the refrigerator for 1 hour. Preheat your oven to 350 degrees and line a sheet pan with parchment paper. Remove the dough from the fridge; unroll the dough and remove the wax paper and place on a cutting board. Slice the log into 1/4 inch slices and place on the prepared sheet pan. As a note, the cookies will not spread much, so you can place them close together. Bake for bout 13-15 minutes, or until the edges just start to brown. Remove from oven and place pan on a wire rack for about 5 minutes. Then transfer the cookies to the wire rack and let cool completely. For an easy and delicious cookie, make a batch or two of these Chocolate Almond Shortbread Cookies today! A delicious twist on the traditional shortbread! yum!